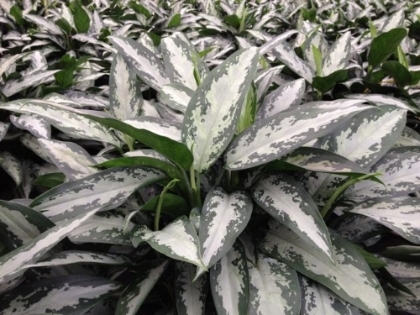 Aglaonema Jubilee and all other varieties of Aglaonema are an ideal choice for a low light interior plant. Aglaonema are commonly referred to as a Chinese Evergreen and are often used for interior landscapes due to their attractive appearance and tolerance of poor lighting conditions. They come in all size pots ranging from a 4″ all the way up to 17″. Aglaonema are one of the slower growing plants and tend to stay round and bushy. Aglaonema are also popular in homes and offices because they are on NASA’s list of clean air plants that help filter harmful chemicals from their environment. Aglaonema are native to tropical and sub-tropical regions of Asia and come from the family Araceae – which is closely related to the Spathiphyllum and Philodendron. Aglaonema Jubilee prefer temperatures in the 60’s and 70’s and prefer a well drained soil. 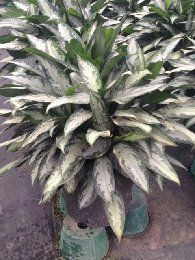 For in-depth care instructions on all Aglaonema varieties, please visit our care instructions here.